If you have young kids like me, then you probably have been forced to watch a lot of crappy kids shows. I’m so glad my boys finally grew out of Yo Gabba Gabba! Lately I’ve watched a few episodes of their latest favorite show, iCarly. It’s a show about a teenage girl and her friends doing a web show. I’m not going to get into it too much, you can read all about it on Wiki. Carly and her friends’ laptops are Macbooks. Instead of the Apple logo, it’s a pear. This is done for obvious commercial reasons. What I find interesting is that the very first time I ever saw the scene where their laptops appeared I immediately knew it was a Mac and I was pretty far away from the TV too. It wasn’t the casing or the color of the laptop, it was the lit up pear that gave it away. I’ve seen fake Apple like product replacement in other shows too. This begs the question: what is a brand without its logo? When most people think of branding, they think of the logo right away. In fact, many branding related articles floating around these days are simply logo tutorials. Although visual identity is important, but it’s not everything. A brand is not just what it looks like, but also how it feels. The feeling part involves years of consistently good customer service and quality products. That association of quality people develop with the brand is ultimately what defines the brand. When people recognize your brand from a tiny altered logo from far away, then you know you have a good brand. Not because of the logo, but because of the association people want to make with your product. Re: Apple – I agree completely.. Their brand and design is so consistent that even watching shows that have laptops that have a sticker or tape over the logo, you can still tell what it is..
I’ve been in, and overheard, meetings where the client will say things like “I think a logo should capture everything about what we do”, which always makes me snicker because I don’t believe that should ever be the case.. you know, because it’d probably be ugly and because what happens when you’re business sights shift? do love that custom case though, wonder how they did it? Total prop? or modified mac? Out of interest, why do they block out the logo? It’s good for Apple and they benefit from having their products on TV (as they do a lot now). It doesn’t really matter to the show either way. Do they just do it out of general principle — i.e. not wanting to advertise if they can help it? @Alex, I think that’s just a standard Macbook with a pear logo. I love how Apple is so keen on its product design, both the hardware and software. Their products are so identifiable, even if you’re shown the corner, edge or partial UI, you’d immediately know it’s an Apple product. The same can’t be said about other computer makers. @Dmitry, I’m guessing TV shows are keen on product placement. The companies that sponsor the shows get their products on screen without disguise. 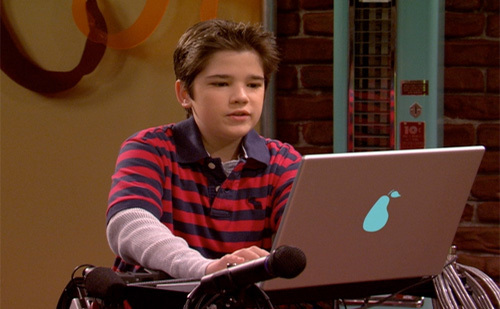 In the case of iCarly, I doubt Apple is a sponsor, but the producers want to associate the show with hip and trendy things. That’s the thing — I think Apple could pay them to have the product in the show — or they could just use it anyway — Apple will surely not stop them doing so since it’s free advertising? Just weird to see them going so far as changing the logo to block out the product placement. It’s also funny on some other TV shows where they put a big sticker over the Apple logo to block that out. Having been on sets and acting parts of TV productions I can tell you that they are VERY careful about showing anything that could have a copyright or trademark. Often artworks will be removed or blurred. This is most frequently seen with logos on clothes. How many music videos have you seen with shirt logos blurred out? Countless? Any owner of the trademark could sue for payment or removal of the product shot. That’s why you see so many “cola” cans and not “Coke” on sitcoms, or in this case a Pear laptop and not an Apple. Why did they go with a Pear? Obviously to be like Apple, to be seen as hip and cool. Apple has associated themselves very well with design and content creatives. Besides, I’d bet most of the post production is done on Macs and we all know how much people love their iMovie. To have any other laptop would be just that… a laptop. Sure, you can do whatever iCarly does with other software but it isn’t top of mind. That, and the Apple/Pear is cute and appeals to kids. My much more functional Lenovo X61 tablet may be more suitable to what I do but it’s “all-business” like black case (which I love and so would Darth Vader) just wouldn’t appeal to the kiddies. But turn to a show featuring people doing what might be considered “work” and then you’ll see that sophisticated yet demure all black laptop show up. I’m wondering also if there is some constraint on direct product placement in children’s programs by law – preventing say McDonald’s or Coke from taking over your child’s brain while you cook dinner. In which case, if you were to use your logo or branding wisely – thus changing the apple to a pear – you might be able to legally circumvent that rule and still be fundamentally recognisable. Thanks for stopping by Steven. I don’t know if there are rules with kids’ shows. I’ve started paying attention to product placement on TV since I made this post. I noticed there are several shows where Apple products are not “censored.” e.g. House MD, Bones and few others. Yes, there are rules pertaining to children’s programming and advertising (overtly or covertly) to kids. I’m not the expert, my wife is, because she is in the business. Changing the apple to a pear has little to do with copyright infringement and more to do with regulation. I would rather use Linux Ubuntu or Linux Mint or one of the 1,000 of free distributions … but that’s just me. You can run the Mac OS on a standard PC using VMware as well… The skin of the computer is custom made.